Have you attempted to learn a second (or third) language and struggled? Are you looking for ways to sharpen your cognitive skills as you get older? Do you know any French, even just a little? Are you interested in languages or language acquisition? If you answered NO to most of the questions and/or were annoyed by the use of four French words here, please put the card back in the book, the book on the shelf, and enjoy browsing in our store for a different read. We have lots! Obviously, I highly recommend this book, but not to everyone. William Alexander is more than a Francophile. He wants to be French. There’s one small obstacle though: he doesn’t speak la langue française. 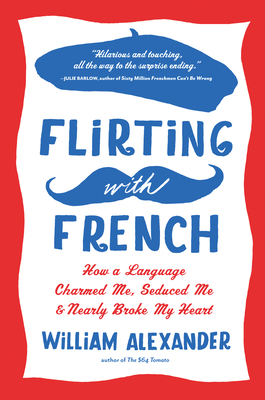 In Flirting with French, Alexander sets out to conquer the language he loves. But will it love him back? Alexander eats, breathes, and sleeps French (even conjugating in his dreams). He travels to France, where mistranslations send him bicycling off in all sorts of wrong directions, and he nearly drowns in an immersion class in Provence, where, faced with the riddle of masculine breasts, feminine beards, and a turkey cutlet of uncertain gender, he starts to wonder whether he should’ve taken up golf instead of French. While playing hooky from grammar lessons and memory techniques, Alexander reports on the riotous workings of the Académie française, the four-hundred-year-old institution charged with keeping the language pure; explores the science of human communication, learning why it’s harder for fifty-year-olds to learn a second language than it is for five-year-olds; and, frustrated with his progress, explores an IBM research lab, where he trades barbs with a futuristic hand-held translator. Does he succeed in becoming fluent? Readers will be as surprised as Alexander is to discover that, in a fascinating twist, studying French may have had a far greater impact on his life than actually learning to speak it ever would. William Alexander, the author of two critically acclaimed books, lives in New York's Hudson Valley. By day the IT director at a research institute, he made his professional writing debut at the age of fifty-three with a national bestseller about gardening, The $64 Tomato. His second book, 52 Loaves, chronicled his quest to bake the perfect loaf of bread, a journey that took him to such far-flung places as a communal oven in Morocco and an abbey in France, as well as into his own backyard to grow, thresh, and winnow wheat. The Boston Globe called Alexander "wildly entertaining," the New York Times raved that "his timing and his delivery are flawless," and the Minneapolis Star Tribune observed that "the world would be a less interesting place without the William Alexanders who walk among us." A 2006 Quill Book Awards finalist, Alexander won a Bert Greene Award from the IACP for his article on bread, published in Saveur magazine. A passion bordering on obsession unifies all his writing. He has appeared on NPR's Morning Edition and at the National Book Festival in Washington DC and is a frequent contributor to the New York Times op-ed pages, where he has opined on such issues as the Christmas tree threatening to ignite his living room and the difficulties of being organic. Now, in Flirting with French, he turns his considerable writing talents to his perhaps less considerable skills: becoming fluent in the beautiful but maddeningly illogical French language.